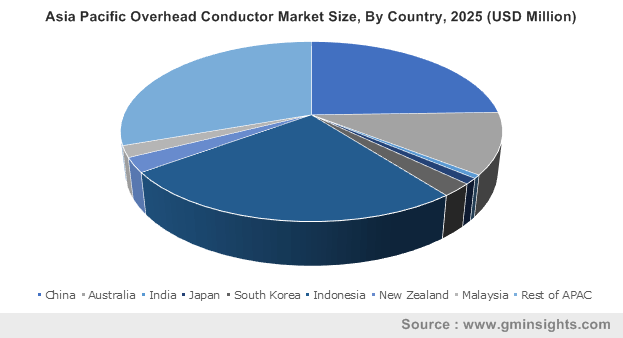 Overhead Conductor Market in 2018 exceeded an annual installation of 70,000 km and is anticipated to surpass USD 950 million by 2025. Positive government measures toward the establishment of cross border electrical networks coupled with increasing demand for upgradation & revamping of conventional grid transmission sub-structures will augment the global market size. Favourable policy interventions in line with positive sectoral schemes have reinforced the electrical industry share, positively influenced by ongoing economic growth. Aggregate technical & commercial (AT&C) losses coagulated by rising electricity demand result in immense shortfall in terms of energy and revenue recognition which in turn will boost the deployment of efficient components. In 2018, ACSR accounted for over 60% of the overall conventional overhead conductor industry share. Effective conductivity, lower extension coefficient in conjunction with efficient tensile strength are prime factors stimulating the product penetration. Furthermore, a large number of conductors have been regularized as there are no sole “wonder material” favouring the industry landscape. In the current industrial scenario, AAAC units across overhead conductor market has observed immense deployment across new electric & refurbished transmission lines. These conductors possess similar dimensions in comparison to ACSR, with stronger, lighter and more conductive properties, even though these pose to be costlier and exhibit a bigger expansion coefficient. These conductors mainly are comprised of aluminium, aluminium alloys, and steel. Overhead conductor market for 132 kV to 220 kV is projected to grow over 9% by 2025. Rapid suburban expansion and commercialization coupled with ongoing upsurge across high-tension transmission grid will complement the business outlook. These products have gained significant industry penetration owing to comparatively heavy scale installation over existing transmission capacity. In the recent years, > 660 kV conductor units have observed substantial growth on account of the rapid expansion for UHT transmission network to resist losses arising from the long distant power supply. Lesser utilization of conductor materials, efficient long-route electricity transmission, and lower sagging are prime factors evaluated to validate the product adoption. Shifting focus towards the deployment of HVDC transmission lines to suffice cross-border power demand will further augment the global market share. 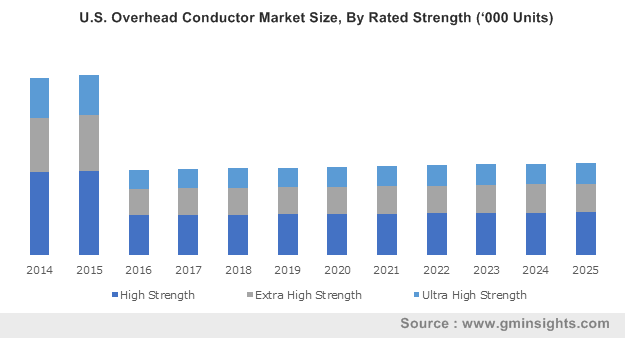 High strength overhead conductor market is projected to exceed an annual deployment of 60,000 km by 2025. Feasibility across utility adhered transmission lines and large capacity industrial deployment will positively influence the industry landscape. These units witness installation across regional transmission network requiring comparatively higher ampere capacity distribution. In addition, operational flexibility, improved conductivity along with low impedance will further foster the product penetration. Ultra-high-strength units will observe growth owing to lower transmission losses across long distance electricity transmission system. Lower conducting losses, effective operational adaptability and longer life span of these units will further boost the global overhead conductor industry size. Overhead conductor from HVAC systems will witness an upsurge on account of higher conductor assimilation for a certain transmission distance when compared to HVDC lines. Moreover, ease-of-voltage transition in line with lesser terminal losses across these circuits will upscale the product demand. Lower number of HVDC conductor installed when compared to HVAC transmission lines for the similar distance justify their comparatively low overhead conductor industry share. Even though, better controllability, effective asynchronous interconnection, minimal short-circuit current & lower losses reflect huge potential for HVDC conductor adoption. The U.S. market in 2018 was assessed over USD 40 million. Growing demand for the revamping & upgradation of the conventional electric grid network will complement the product demand. The installation of a sustainable grid network coupled with advanced technological development will foster the industry dynamics. Increase in energy demand in conjunction with rapid infrastructure investment will further complement the industry outlook. 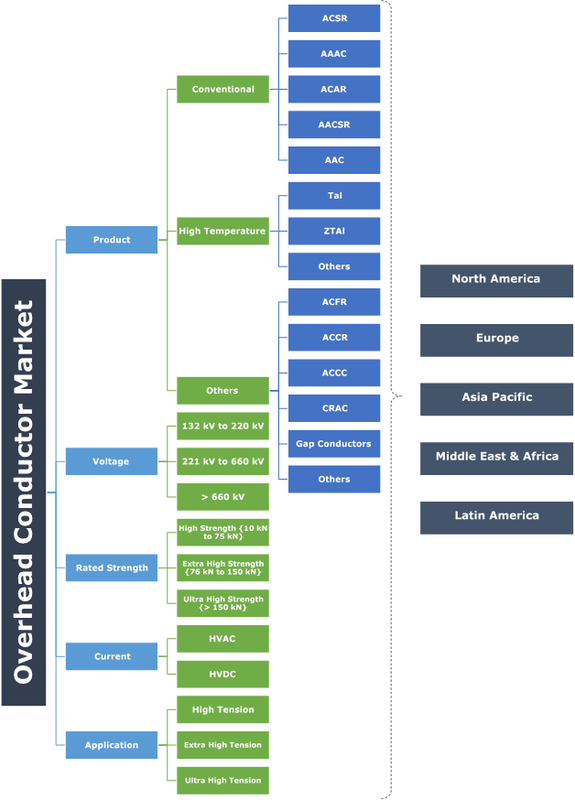 The overhead conductor market share across Europe will witness substantial growth on account of stringent energy efficiency regulations coupled with growing share of renewable energy sources. Government with an objective to establish a sustainable energy system have been channelizing investment to serve their electricity generation, transmission and distribution networks. EU’s policy aims at fund allocation and restructuring, towards a stable grid system to suit renewable energy resources & suffice the increase in energy demand. Eminent overhead conductor industy participants include LAMIFIL, ZTT, Sumitomo, APAR, Nexans, CTC, Prysmian, LUMPI BERNDORF, General Cable, Special Cables, Neccon, 3M, Taihan, Midal, Gupta Power, KEI, Diamond Power Infrastructure, Jeddah, SWCC, Southwire, CABCON, Oman Cables, Galaxy, Alcon, China Top Cable Arrow, Bekaert and Kelani. Large scale R&D investments to suffice the rising demand for effective and reliable conductor compositions coupled with inorganic growth development have been the prime strategic inferences coagulated by the eminent industry participants. Overhead conductor is a component that is applied to transfer energy between two adjoining intersections of power network. These units are deployed by industrial, consumers utility, and commercial across HT transmission network.